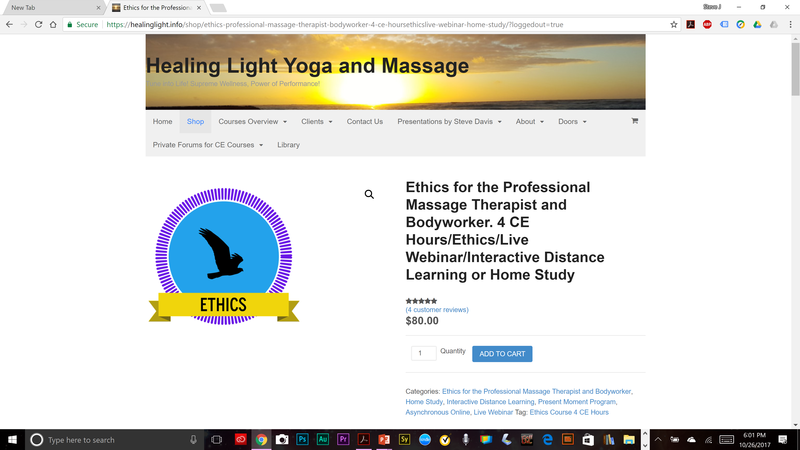 My course was a very enjoyable hour live webinar video with Steve. I was able to see him and hear what he was telling me. He was able to share his presentations, videos and computer screen via the video as well. The ethics regulation sections have recently changed. Steve had the old vs new wording well organized so that the differences were easy to see. He went over the changes thoroughly and confirmed my understanding. I recommend this course. Thank you Steve! This was a GREAT way to get 4 hours of ethics that complied with Oregon’s stringent CEU requirements. The instructor was very friendly, super helpful, and excellent at responding to students needs and/or questions. The video conferencing apps installed easily and painlessly on both my android phone and Windows PC. As per the instructions, I tested both out early as to make sure I knew how things worked for class. I ultimately used the PC for the big screen advantage. At this price and ease, you can bet I’ll be taking his future ethics clssses for ceu’s. Great online/web class. Very informative, instructor covered a TON of info within each section & also included many different experiences with his own practice that many LMT’s (might possibly) experience themselves. Also shared ways to fix/correct/adjust for future clients/treatments. I cannot say enough good things about the course & instructor. Instructor was more than willing to help out answering any/all questions I had & also helped me find different ways to help educate patients/clients on many different issues/concerns many of them might have with expectations of massage treatment/session. This 4 hour Ethics class is highly informative & if put into daily practiced use WILL HELP any/all massage therapists become better prepared, properly educated, safer, & a better well-rounded Theraputic Massage Therapists. Thank you Steve for an AWESOME CLASS!!! & Thank you for being MORE than willing to take extra time in answering all my questions I had after each lesson! Steve is an expert in this topic! I appreciate that he made the time and effort to put this course together. It was so convenient to take. Thanks Steve! Steve made this renewal process for my license super easy. This was a very organized and streamlined online experience. Also, your prompt attention to answering my question was much appreciated. Your level of care for this profession shows! Thanks so much Steve! FIVE STAR REVIEW ON YELP from Stephen B. FIVE STAR REVIEW ON YELP from Sandy M.
it looks like my review was ‘filtered.’ I will post it again. 12 August 2013. FIVE STAR Google review from Sandy M.
“I have been a client of Steve’s for over four years and can highly recommend his work. He absolutely deserves five stars for his ability to combine yoga and therapeutic massage to help his clients. He helped to alleviate my scoliosis, totally released my neck so that I can turn my head without stiffness and pain which I had not been able to do for years and taught me a yoga routine that I use every day to maintain strength and flexibility. He works with people of all ages. I am one of his older cIients, and he has helped me to have confidence that although I grow older, I can still have the ability to live life at its fullest. 25 July 2013. FIVE STAR Yelp review from Sandy M.
“Steve Davis deserves 5 stars for his marvelous work in yoga and massage. I have been a client of Steve’s for over 4 years, and he has helped me with scoliosis, has totally released my neck so that I can turn my head without stiffness and pain which I had not been able to do for years, has taught me some wonderful yoga poses and stretches that I do every day to maintain strength and flexibility. I am one of his older clients and I can tell you that he is able to help people of all ages. He is a very caring person – cares a lot about his clients, and often gives more time than they pay for; I know that for sure. After hearing Steve talk about yoga at a Tualatin Chamber of Commerce meeting, I was curious to know more. Having suffered from shoulder and neck problems for years, and receiving no relief through chiropractic, naturopathic, acupuncture, acupressure or physical therapy, I figured I had nothing to lose. After a month of doing the yoga movements Steve taught me, and being rigorous in practicing it daily, I have a greater range of motion, less pain and better balance overall. Further, the practice leaves me with a mental clarity I would not have believed, being naturally skeptical by nature with regards to “these types of practice”. Consider me a believer now, and Thanks, Steve! A sincere letter of recommendation for Steve Davis. I have been under the practice of, and learning from Steve for just over a year. His beneficial knowledge and professional experience have had amazing benefits to my well being. Steve employs a variety of skilled methods to find what muscles or postures were causing me discomfort. Every technique he used was versed with a profound body of experience, respect and years of practice. I am also continually impressed by Steve’s willingness to share his knowledge about exactly what he is doing and how it benefits me. 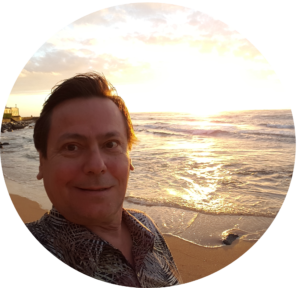 In my opinion, Steve is much more than a Licensed Massage Therapist and Yogi; He is a master practitioner of the world’s most ancient health and healing arts and therapies. Steve’s knowledge of the human body and modalities of intervention is exceptional. His work targets areas of difficulty with precision, while simultaneously addressing systemic imbalances on every level. Worth a visit if you are struggling with real issues. Thanks again Steve for your help. Namaste. This greeting card is to let you know how appreciative I am of your massage and yoga class. I’ve enjoyed your teaching in the art of mental clarity and physical endurance. Thanks for giving me these invaluable skills. The massage was a blessing from heaven! • “Steve Davis is a real healer. I have been seeing him for over three years, and he helps me a lot with my health problems. I had frozen shoulders from my work, and he made my hands and shoulders start to move again freely, with no pain. I feel much better because he knows how to help people in my situation. He uses special techniques, including hot stones and yoga, and everything together really relieved my muscle and joint pain. I highly recommend Steve to anyone needing a massage therapist. • “Steve Davis is an awesome yoga teacher. His expertise and knowledge of classical yoga surpasses all other yoga classes I have taken. In a few weeks of practicing yoga with Steve, I have attained significant body strength, flexibility, and energy. I also feel more alive in spirit, body and mind. Steve is a great teacher who can help you progress on an accelerated path to fitness and wellness. He takes time during yoga class to give each of his students individual instruction on each asana pose which is very important. Yoga is body, spirit, soul, beauty, grace and art all in one that Steve performs and teaches very well. Thank you Steve. I honor your light and path as a yoga teacher and friend. 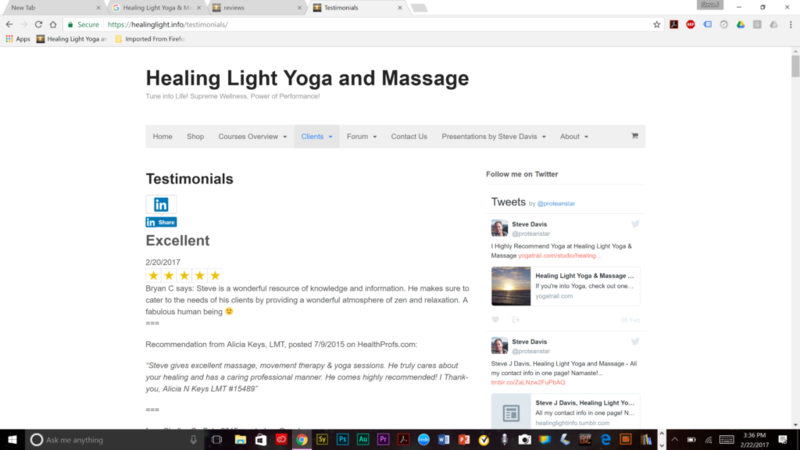 • “I have been attending yoga classes and receiving massages from Steve for a little over a month now, and I can tell a great deal of difference in how I feel. I sleep MUCH better – fall asleep immediately and back again should I wake up in the middle of the night. This was not my pattern previously. Also, my digestion is better and I have lots more energy. Steve discovered that I have a slight case of scoliosis in my back and is using both massage and yoga postures to correct it, along with helping me find exercise machines in the gym that can also be beneficial. I can highly recommend Steve for both yoga and massage. He is highly trained, has had a lot of experience in these disciplines, and is very focused on doing the best possible job for all his clients. • “I have been taking Yoga from Steve Davis of Healing Light for over a year now. In that time, I have made amazing progress. Steve provides patient, individualized attention to a student’s personal goals. Class is tailored to meet those needs. And it is never boring. New poses are introduced and there is a lot of variety in the warm-up. Although I have participated in yoga classes on and off for several years and had many different teachers, I feel that Steve’s class is responsible for my increased flexibility, strength, balance, and ability to maintain my peaceful frame of mind throughout a busy day. 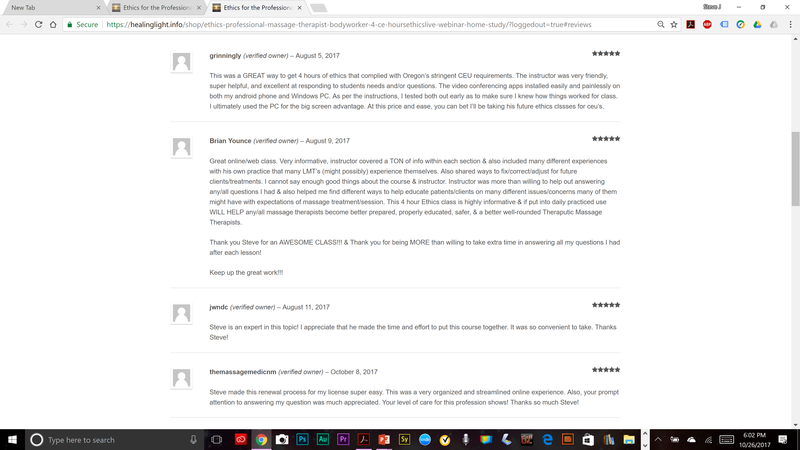 I highly recommend Steve to any beginning or advanced student. • “I went to Steve for constant tightness in my shoulders. His massage was like no other I’ve ever received! He really gets in, works on problem areas, and seems to know where they are. He went out of his way to study my situation and found ways to resolve it. He has relieved my pain; it took several sessions of massage, his hot rocks, and yoga stretches. My fascia adhesions are gone, he has worked them loose! After my first massage I noticed I could turn my neck further than before, breathe, and stand up straight, while walking uphill . . . I highly recommend Steve!!! Thank you so much for taking the time to come talk to our class and teach us about yoga. We had a lot of fun learning about the history of yoga as well as learning some of the yoga poses. We never knew about how music was incorporated into yoga. You taught us a lot about the importance of the role yoga can play in living a healthy lifestyle. One of our classes favorite parts of your presentation was when you played the flute for us. It really engaged our minds into learning yoga and meditation. Again, thank you for driving out here and teaching our class. Good luck on your trip. We hope you have a blast and learn a ton!